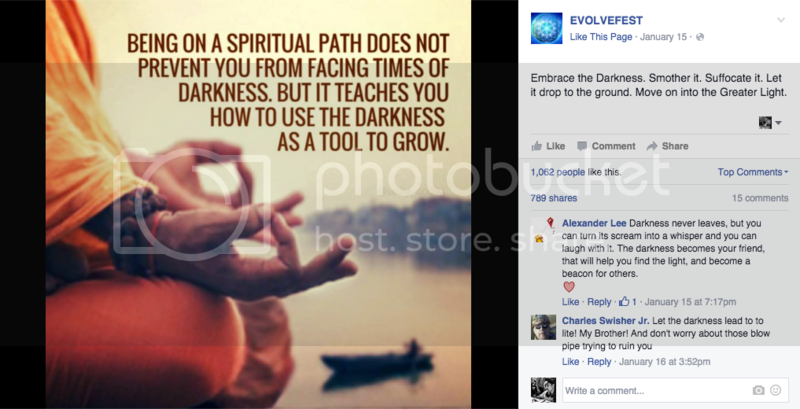 On December 13th 2014, the eve of the second anniversary of the Sandy Hook massacre in Newton, CT, tiny New Jersey-based transformational festival Evolvefest posted a meme on their Facebook wall; but rather than the typical psychedelic airbrush art or spiritually-motivating quotes that had built them a fanbase of around 300k, the meme stated: ‘Keep Calm and Expose the Sandy Hook Hoax’. That was the moment at which the core community of Evolvefest goers recognized that its founder David Andrew Bryson had finally cracked. Over the next few days he posted a number of badly photoshopped images that supported the much-harked conspiracy theory that Sandy Hook was a government ploy designed to strip Americans of their second amendment rights. Aggressively defending the right to bear arms and displaying a blatant lack of sympathy for those that died in the massacre was at stark odds with the page’s vast New Age-leaning audience. 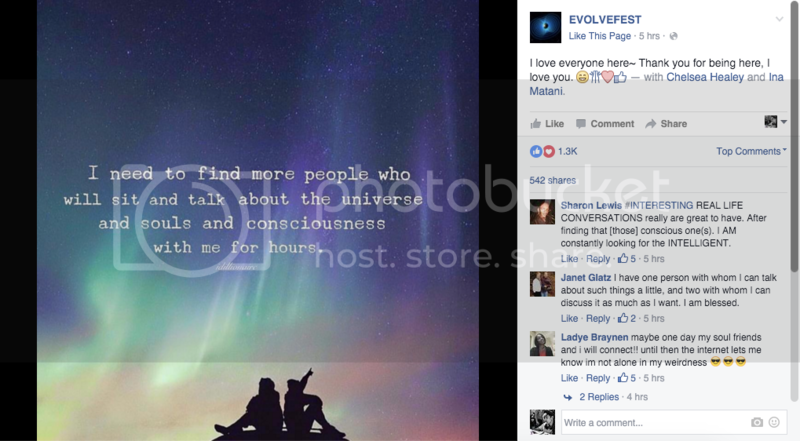 The small, close-knit festival community built around the Evolvefest page was baffled. The languid, thousand-or-so capacity annual gathering that a core community of Northeast hippies had worked hard to build had had its disproportionately popular Facebook page hijacked by the festival’s central figure. But the immediate backlash from the community resulted in Bryson ramping up his paranoid rhetoric whilst deleting every single post and comment that criticized his viewpoints. 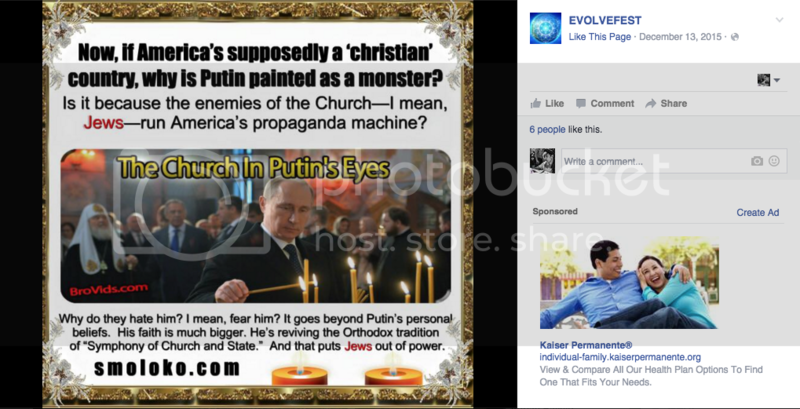 Bryson’s Sandy Hook outburst cost Evolvefest around a thousand of their core followers. But a week later the page had gained 10,000 new followers. As the weeks rolled on, Bryson continued to use Evolvefest’s Facebook page as a soapbox and megaphone for his increasingly extreme rightwing views. He launched a splay of attacks on Jews, Muslims, and homosexuals, all the while honing an Old Testament tone, and completely transforming the page’s perspective from representing a subculture of heady alt-liberals, to rousing the paranoid, extreme right that skirt around the internet seeking “proof” of shadowy institutional agenda. The post unleashed an enormous response from the community towards the festival’s founder. A Facebook group called ‘Boycott Evolvefest’ was promptly formed by core members of the original New Jersey collective that patronized and volunteered at the event. Dismayed at how the heretic founder had taken something they had built collectively and skewed it to his own bigoted agenda, they set to work spreading the word against what Evolvefest had become and attempted to put a stop to Bryson’s fervent hatemongering. But Bryson continued, announcing that the 2015 festival would in fact go ahead and that it would be staged on “Private Farm, NJ”. Via an allegedly fictitious non-profit, Bryson collected money for the tickets (starting at around $230 and climbing steeply) and acted as if all was well and that Evolvefest was going to rise again, better than ever and unscathed from the considerable backlash within its core community. But perhaps unsurprisingly, the 2015 festival never went ahead, and Dave Bryson took to his well-trodden battleground of Facebook to unleash scorn on those that publically requested a refund for their tickets. The 300k-strong online “community” is at first bewildering when you consider the size of the festival. By all accounts, Evolvefest rarely catered to more than a couple of thousand northeast hippies looking to get weird every Labor Day weekend in New Jersey. But Bryson has been referred to as a “social media idiot-savant”, somehow amassing hundreds of thousands of followers by reposting Mother Earth art, sacred geometry and spiritually informed quotes. Though the last year has seen him take considerable steps further in influence by also becoming a prolific meme resource for the alternative, extreme right. Some of our sources for this article - most of whom requested to remain anonymous - first encountered David Bryson around 2004 at the Grist Mill Café in Andover, NJ at an open mic night he ran for the local community. The well-set, soul patched tripper in his late 30s had created a space for the disenfranchised weird kids of Republican haven Sussex Co. to come and hang out, be themselves and play music on Friday nights. Bryson would perform his solo acoustic numbers, and occasionally jump on bass with a classic rock cover band, and the nights would reportedly draw hundreds of young people from the surrounding area, most of whom would hang out in the parking lot outside. However, despite being a musical mentor for many of these kids, several sources told us that Bryson would flirt inappropriately with many of the young girls at the Grist Mill, often offering them massages. Though each was quick to insist that they were not aware of Bryson engaging sexually with minors. In 2007, Bryson and some local acts from the open mic night were booked to perform at a fundraiser in Blairstown, NJ for an environmentally-focused kids camp. The following year Bryson reportedly took over the fundraiser, named it Evolvefest, shifted its focus, and moved the event to the Sussex Co. Fairground. 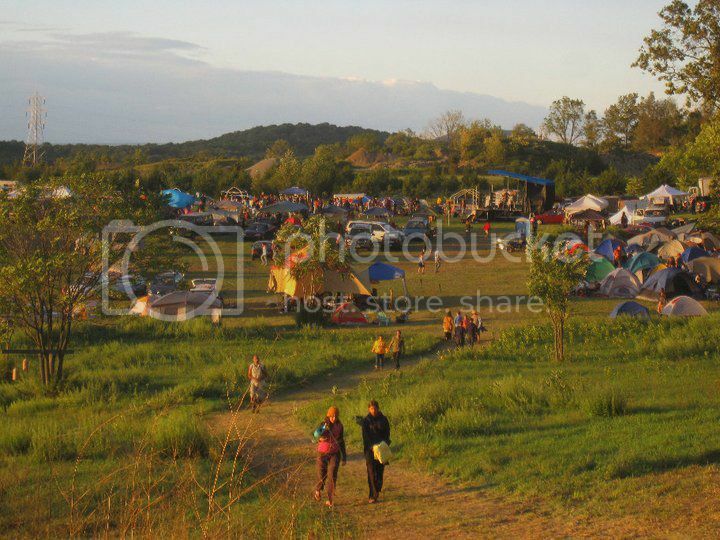 Built around the extended community of alternative souls that frequented the Grist Mill and northeast psy-kids that shambled along the transformational path in the region, Evolvefest was a relatively unremarkable gathering of vagrant bodies looking for a place to play music and take drugs. Evolvefest Music & Yoga Festival from ThoFarm Productions on Vimeo. Patrick noted that the community largely considered the maiden Evolvefest a failure, and that it placed a considerable amount of debt on Bryson’s shoulders. But despite the founder’s relative financial peril, the festivals continued, relying on the strong support network of local volunteers and the good graces and abundant vibes of the transformational community. The ensuing years saw the festival migrate around New Jersey – allegedly due to Bryson’s consistent inability to pay lease fees – though maintain a modest capacity that ranged from a few hundred to a couple of thousand. The programming continued to be predominantly local jam bands, the occasional psy-leaning electronic act, though over time there was an emergence of lectures and yoga, which Bryson had reportedly started teaching at the local YMCA. The 2012 festival was marred by the death of a young man named EJ, who succumbed to a pre-existing heart condition after he forgot to take his medicine at the event. As he lay on the ground in a seizure some of the festival goers formed a circle around his body and started chanting rather than seeking medical attention, which one source claimed wasn’t even provided at the festival. The following year problems and disputes were beginning to occur between Bryson and his volunteer staff. Increasingly immovable from his vision for Evolvefest, he refused to heed advice on certain logistical and creative issues, and for Mick this was the beginning of the end of his relationship with the festival and its founder. The last Evolvefest was held at The Fellowship Farm in Pottstown, Pennsylvania, a nonprofit retreat that has long been a supporter of alternative and progressive viewpoints (both MLK and JFK were reported to have spent time there during the 60s). This is when there was a notable departure from the standard fare of innocuous music, yoga, and wellness, and the longstanding Grist Mill Café crew started to become ostracized from the event. Bryson booked himself in for a two-hour slot - most bands only got an hour and half - early Saturday afternoon, and rather than serenading the crowd with his folksy acoustic jams, he debuted his conspiracy theory-laden ranting to a dwindling crowd of confused families and yogis until there was almost no one left. That year is said to have ended with the usual debacles surrounding the musicians and landowners not being paid, and the staff feeling ill-treated and undervalued by an increasingly erratic and megalomaniacal Bryson. Around three months later he posted the Sandy Hook hoax meme on the festival’s Facebook page, and the transition from spiritually vagrant hippie to neo Nazi extremist was set on a course that would baffle and deeply hurt the community of which he’d once been the lynchpin. 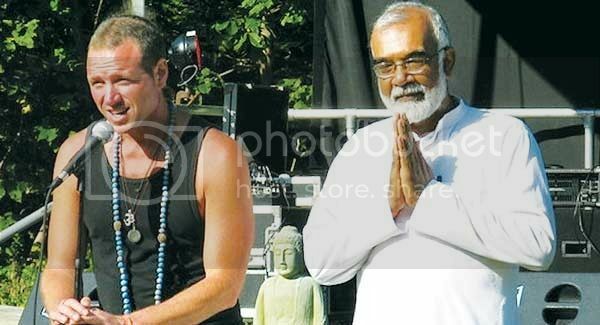 But as the American alternative left and Burner community has become embroiled in this online battle they’ve been left wondering, how can someone that continues to espouse the values of mysticism, spiritualism and New Age philosophy also be a bigot, a homophobe and an ardent supporter of white supremacy? Aren’t those black and white perspectives, and among the most polarizing viewpoints imaginable? 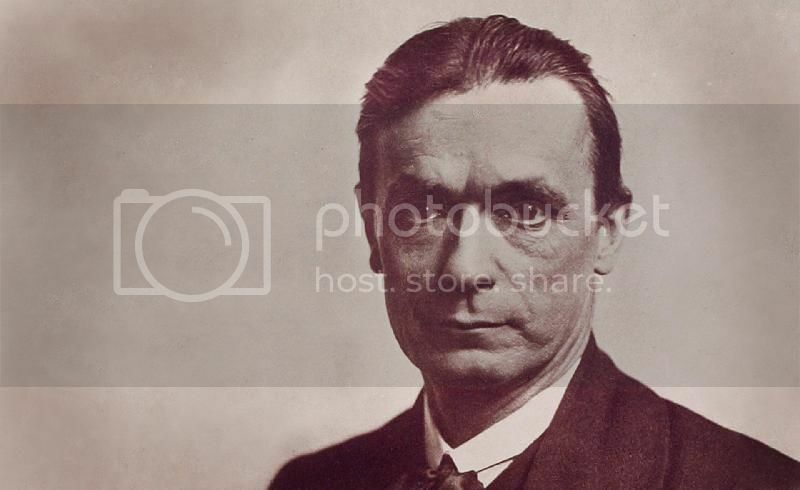 Anyone bewildered about the cohabiting of New Age ideology and far right extremism would do well to look into the opinions and life work of Austrian pseudo-scientist Rudolf Steiner. He’s known to many in the United States as the founder of Anthroposophy and biodynamics, a commonly practiced form of organic agriculture that, among other practices, often involves burying cow horns filled with manure and using astrological prompts to inform planting cycles. Starting his career as a literary critic in the late 1800s, Steiner was a prominent theorist in esoteric and occult thought, though never actually applied himself to farming. His assistant Ehrenfried Pfeiffer was the first to identify the potential drawbacks of the prominent chemical farming techniques of the early 20th century, and together they developed the theories of biodynamics, which today are largely endorsed by alternative farming communities and through the Waldorf School, which teaches Steiner’s principles in over 1000 institutions worldwide. But what the biodynamic community will not tell you is that their spiritual idol was in fact an outspoken racist, and a staunch believer in the superiority of the Aryan race. He and his occultist peer Helena Blavatsky believed that the Aryan race was the “the final adjustment of the human organism, which became perfect and symmetrical only in the Fifth Race”. In fact some of the earliest adopters of biodynamic farming were the Nazi party. Many of the allusions to white supremacy in Steiner’s work have been conveniently lost in translation from German to English, and what remains is a distinctly more left-friendly progressive theory on farming. "There are lots of historical connections between esoteric and New Age thought and the far right,” says Peter Staudenmaier, professor of modern German history at Marquette University, and specialist in occultism in Nazi Germany and ecofascism, “though the connections shouldn't be overstated; there are just as many links to the left as well. One long-standing theme is a strong belief in racial hierarchy based on an evolutionary model (an anti-Darwinian model, one built around a conception of cosmic evolution); that has been a significant element of esoteric thought since the nineteenth century. Variations of it can be found in Theosophy, Anthroposophy, Julius Evola's work, and lots of other sources popular within the New Age scene. “The basic notion is that in any given epoch, a small group of select souls strive toward evolutionary advancement while the masses devolve into a benighted state, and in many versions of the theory these distinct evolutionary groups are marked by racial differences. Beliefs like these are widespread throughout various sectors of the esoteric and New Age milieu, though they aren't always acknowledged in public discourse." So while in the United States New Age ideology came to prominence in the 60s and 70s - a period in which the alternative youth was mobilized by a push for gender, racial and sexual equality - esoteric thought and left-leaning liberal values are intrinsically linked, though in Europe racially contentious sentiment and spiritualism are rather more common than you might expect. But while a tangent in theory can certainly be drawn, much of Dave Bryson’s erratic and reactionary thought patterns can also be traced to his alleged drug use. Reportedly a frequent user of psychedelics such as LSD, magic mushrooms and DMT, Bryson also had a soft spot for a lunging nitrous oxide and ecstasy adulterated with methamphetamine or heroin. But while the head-communities in northern New Jersey were ardent about the spiritual exploration and ritual connected to their drug use, Bryson’s participation didn’t align neatly with that. “Dave was certainly a part of our community of experimental drug users,” notes Patrick, who tripped with Bryson between five and ten times over a period of a few years. “But it’s my belief that people show their true character in those situations, and I personally found Dave to be a cosmically superficial person. There isn’t a lot of substance to what he talks about. The irony in this is that Evolvefest has explicitly stated that its ‘Drug-free and family friendly’. Though hardly a surprise for a music festival to adopt an outward stance of zero-drug tolerance to be complicit with the law, the fact that Evolvefest uses this as a selling point is grossly misleading, given the prevalence of drugs both at the festival and regularly coursing through Bryson’s brain. Conspiracy theories and habitual drug use go together like dreadlocks and patchouli, and while there may be other influences at play in Bryson’s complex headspace, it would be naïve to reject the notion that he’s pickled his head with substances over the years. But even while some noticed the early cracks forming in Bryson’s character, all were shocked to learn that his New Age and mystic inclinations had manifested themselves as white supremacist and anti-tolerance rhetoric on the Evolvefest community Facebook page. But there is certainly a growing concern that he’s becoming more politically active. In May of 2014, a scratchy, lofi Bryson discussed his candidacy for president of the American sect of the Ubuntu party on a podcast called Liberty Aid. The Ubuntu party is a fringe South African progressive socialist group founded by pop singer-turned-activist Michael Tellinger, and in the interview Bryson outlined his lofty aspirations for taking the party into the American political mainstream, and, interestingly, into the White House. This writer can certainly attest that since initially investigating Evolvefest, the ramblings and shotgun spray of hatred are becoming more precisely aligned with the growing Trumpian movement in the darker recesses of the internet. Rallying calls to jaded liberals to join him on the “alternative right”, whilst accusing multiculturalism of being a “genocidal scam based on the hatred of white Europeans”, Evolvefest also validates Trump’s slurs against Islam, which have become considerably more widespread since the GOP presidential candidate normalized public hatred towards the world’s second largest religion. A recent post on the Evolvefest page showed a merry Bryson, thumb held high in front of Trump Tower in Manhattan. The post is followed by a photograph of the One World Trade Center, and an accusation that "Israel did 9/11". But given Bryson’s reportedly charismatic nature and longstanding aspirations to form political groups, this recent turn in such a deeply polarizing political climate could be a potentially dangerous evolution in the storied history of David Andrew Bryson and Evolvefest. After our phone conversation in which Patrick umm’d and ahh’d about the likelihood of Bryson being considered “dangerous”, he returned to the Evolvefest Facebook page for the first time in months, having largely filed his experiences in the past. But this also represents a warning to the growing alternative New Age scenes that are once again gaining traction across America. Festivals like Burning Man, Lightning in a Bottle and Canada’s Shambhala have been facilitating alternative lifestyles and New Age values for years, and with the often liberal psychedelic use that goes hand-in-hand with the scene, it’s more than a little disconcerting when you consider the path that lead to Evolvefest’s demise. And while David Bryson is just another deranged bigot spewing hatred on the internet at the moment, there’s no reason that he couldn’t replicate his agenda offline given his experience galvanizing groups of impressionable people together. A recent post on his personal Facebook page appears to close the chapter on the Grist Mill folky, the festival founder and the New Age ideologist, and starting anew, as something considerably more dangerous, opaque and, frankly, bizarre. “As much as I love the people in my scene, I have to be honest and say that the Neo-Hippie, Neo-Shamanistic, New Age Transformational scene is largely self-absorbed, myopic, disorganized and thus, ineffectual in producing radical global change as a short work. This is part of the new vision of Evolvefest going forward - a Gathering of Lions who are ready to fight and are no longer cowed and intimidated by false philosophies and puerile spiritualities that reduce manhood to a messy puddle of scared pee-pee on the floor. Click here to support the Boycott Evolvefest Facebook page. Africa’s biggest arts festival, opens up project and bio burner registration for 2015.